Home»Blog»Deals»SiteGround Black Friday Cyber Monday Deals 2018 – 75% Off Extended! SiteGround Black Friday Cyber Monday Deals 2018 – 75% Off Extended! Oh no, you’re too late! The SiteGround Black Friday, Cyber Monday sale 2018 has just ended, but we’ve got good news: you’re still entitled for SiteGround ‘s usual introductory price! Check out the details here. 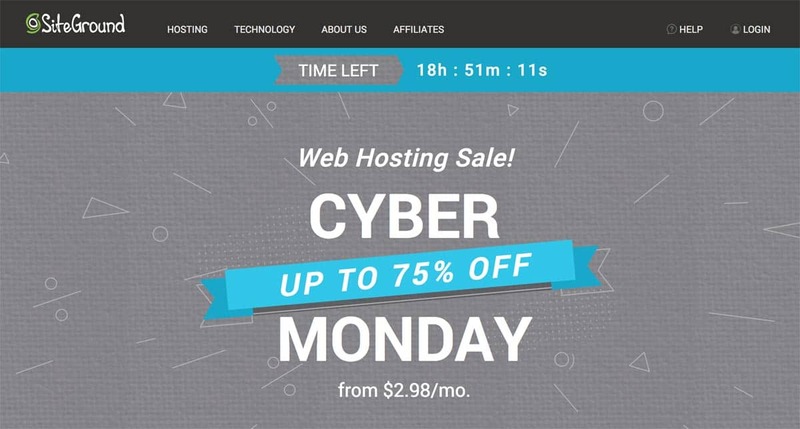 You see, with most stores giving out mad 50% discounts on their wares, SiteGround has decided to smoke the competition and make Black Friday Cyber Monday really worth our while, with a MASSIVE 75% off all their annual shared web hosting plans! * 75% off! Price starts from $2.99 /mo with unmetered data transfer. 75% off all web hosting plans is absolutely unbelievable, and it’s a deal I personally wouldn’t miss. The only caveat is this – SiteGround’s Black Friday Sale is only valid for 24 hours, so if you miss that window, you can kiss your savings goodbye. You guys are really lucky. With such great reception, SiteGround has decided to EXTEND this Black Friday Sale over to the weekend! You now have until 25 Nov 2018 to get your web hosting! Okay, so this unprecedented sale has been extended till the END of Cyber Monday, which means that you’ve got the next 24 hours to purchase your web hosting at these insanely low prices! Best get to it! If you’re planning to get yourself a new account, or switch web hosting (good news, site migration is done completely free of charge by SiteGround!) you best plan out your daily schedule cause you won’t want to miss this massive sale! * 75% off! Get free website migration with GrowBig or higher plan. After the discount, you’ll be enjoying SiteGround’s GrowBig plan at only $4.99 a month! It really doesn’t get better than this! If you’re in the market for a new web host, do wait awhile for this deal. It’s just around the corner and you’ll be saving yourself so much more! If you folks are still on the fence about SiteGround, I highly recommend getting off the fence now! And purchasing this excellent web hosting account. You see, it’s not a common practice for SiteGround to give out discounts. As a matter of fact, they’re actually quite stingy with discounts. I have friends that change their relationship status more often than SiteGround dishes out their deals. But when they do, BAM! 75% off, biggest sale of the year. Cyber Monday, the next 24 hours WILL be the last day of their 75% discount. Do grad the deal before it goes! Who is SiteGround & are they good? Founded back in 2004 by a bunch of friends, SiteGround has since grown to service more than 1,700,000 domains all over the globe. They specialize in shared hosting, cloud hosting services and dedicated servers. They also provide email hosting and domain registration services as part of their portfolio. Services aside, SiteGround is pretty damn awesome when it comes to speed boosting features. The one thing that comes to mind is their built-in Supercacher – it boosts your site loading speed by 4 times! With 5 datacenters across 3 different continents, you won’t have to worry about server speed. You just have to pick the datacenter closest to your target customers and let SiteGround work its magic! Check out our complete SiteGround review here. * Biggest sale event! Plan starts from $2.99 /mo.